Aesthetic gum grafting is available to stabilse gum recession, and/or to improve the aesthetics of your gum line. Exposed tooth roots are the result of gum recession. Perhaps you wish to improve your smile by covering one or more of these roots that make your teeth appear too long. Or, maybe you’re not bothered by the appearance of these areas, but you cringe because the exposed roots are sensitive to hot or cold foods and liquids. Your gums may have receded for a variety of reasons, including aggressive tooth brushing or periodontal disease. You may not be in control of what caused the recession, but prior to treatment we can help you identify the factors contributing to the problem. Once these contributing factors are controlled, a soft tissue graft procedure will repair the defect and help to prevent additional recession and bone loss. 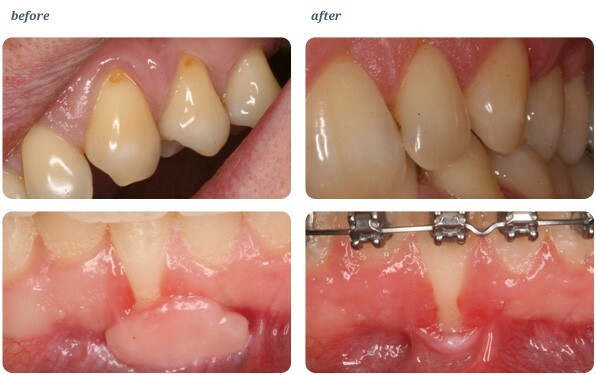 Soft tissue grafts can be used to cover roots or develop gum tissue where absent due to excessive gingival recession. We take gum tissue from your palate or use an artificial substitute. This is then transferred to the operating site.This can be done for one tooth or several teeth. A periodontal pack to protect the areas and promote better healing is sometimes used. This packing is usually worn from 1-2 weeks. Is aesthetic gum grafting painful? On the palate, if tissue is removed, it will feel like a pizza burn at the surgical area. We may prescribe some pain medication to help you get over the discomfort or pain. This is very delicate surgery and you must follow our advice sheets supplied. With certain grafts there will be an aesthetic difference, therefore we will address this were indicated. For more information click here.